Derrick Coleman is the fullback for the Seattle Seahawks – he’s also the first player for the NFL to be legally deaf. Earlier this year, he appeared in a commercial for Duracell encouraging people to “trust your power”. And the particular message Coleman delivered resonated deeply in the hearts of two young girls as they sat at home in front of their television, watching. Riley and Erin Kovalcik are 9-year-old twins from New Jersey who also wear hearing aids, and they loved seeing Coleman in the ad. “The first time I saw it, we were actually tearing a little bit,” says Riley. So she took it upon herself to write a letter to her “inspiration,” letting him know that she has faith in him, and encouraging him to try his best. The twins’ father was so touched by the letter that he decided to post a picture of it on Twitter, tagging the football star. What happened next was more than any of them could have expected! Not only did Coleman see the letter and respond with one of his own – along with the help of ABC’s “Good Morning America” and Duracell, he surprised the twins with the meeting of a lifetime! 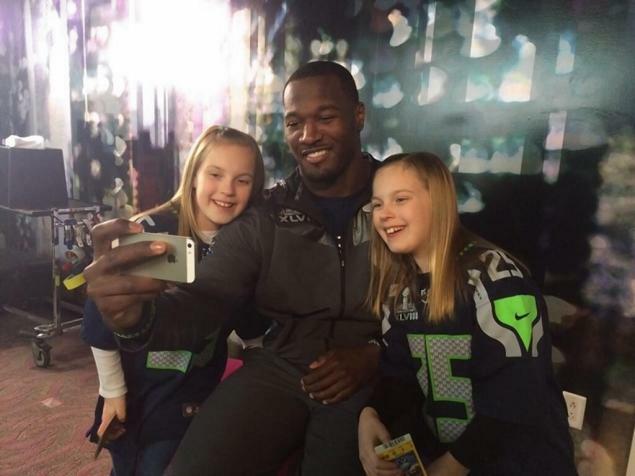 In addition to chatting with the girls, comparing hearing aids, and taking selfies, Coleman also presented the family with seats to the biggest football game of the season – the Super Bowl – where they could sit and cheer on their favorite player. Oh my gosh! The joy on their faces when they first see him! It’s just too much. I can only imagine their excitement as they sat watching Derrick and the rest of the Seahawks team WIN the Super Bowl from the 9th row! Like I said at the beginning – if I had heard this story yesterday, I would have been rooting for them all along! ohmygoodness! What a beautiful story! Thanks so much for sharing!